2. It's Pay Day Friday! 3. It's Pay Day before a Long Weekend Friday!! 4. I got a primo parking space at work. 5. The Starbucks Barista told me they still had Chestnut Praline syrup. I got a Chestnut Praline Latte! What?! 6. I look super cute today!! Life is so awesome around here this morning. To top it all off, I'm here writing and you're here reading my words. How am I so LUCKY!?! 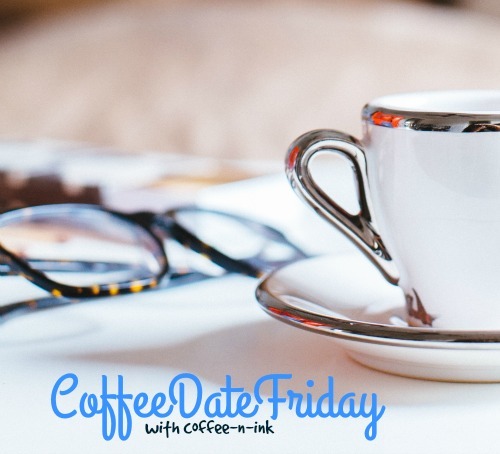 Welcome to another edition of Coffee Date Friday, too! So how is your Friday going? Well you can see I'm doing pretty dang marvelous. It's been a really good week - emotionally, professionally, relationship and friendship-wise. My spirits have been high and even though I had a couple of WTF moments this week, nothing could bring me down. I've felt truly blessed all week. So you know how I just am in love with my husband, right? He's been with Annika now for two weeks and I am falling for him even more. I love how he is with our kids. I am so very lucky to be sharing this life with him. He always tells me I won the lottery when I married him...and I think he might be right! Ha! We're a really good team. God sure did a good job preparing us for each other. Thank you Jesus! Miah, Lucas, and Annika are home together today since the older two are out of school today. I had extra time to myself this morning because I wasn't rushing everyone to Wake Up! Get ready! Eat your breakfast! Put your shoes on! I left this morning with all three of my kids cuddled up in my bed next to their Daddy. It was definitely a Kodak moment...but I just committed it to memory. Something I don't need to share on social media - that's something just for me. It's so good...so good for this mama soul. I got my #galentineswap2016 package yesterday! It was filled with chocolate, nail polish, a to-die-for lip butter, candle, and mini soap. It was so sweet. My Galentine done good! My Galentine was @maddieroo. You should check out her blog. She's a no-nonsense girl that I have the honor of knowing personally. We went to high school together! Speaking of friends...I went for a quick bit with a work colleague turned monthly lunch date friend yesterday. It was so yummy! We went to this little sandwich place in Pasadena. I hadn't been there since I was pregnant. It was as good as I remembered. I was able to see how my friend is and give her some encouragement. You know as well as I do that this roller coaster called Life can sure be hard sometimes. That's when you just need to talk it out, uninterrupted, and then hopefully listen as well and get some perspective from someone on the outside looking in. I was able to do just that for my lunch date yesterday. While I was listening and then talking it out with her, I realized something. I had a lot of good points to give. I'm not tooting my own horn here, really..but, I felt like I was able to help her out just a little. Make her feel validated, that she has purpose for this life, and she just needs to be brave. Hopefully she'll take the advice that I give myself. She, just like me, needs to be More for herself. Thanks for stopping by for a cup and a little chat. So, your turn! What's up with you, lovey? Linked up with Alissa today...Are you? I love that you're having an awesome week this week and that you got to have lunch with a friend. Connecting with others is such an important way of filling our cup. Thanks for having coffee today with me friend! It sounds like you are having such a great week! Isn't it amazing how much more we fall in love with our husband's when we continuously see how amazing they are with the kids? I swear I fall more and more in love with my husband every single day! I hope you have an excellent weekend!